The Leader Phrase Book contains more than 3,000 dynamic phrases that will enable you to prevail in virtually all of life's important ituations. You will be in command of your words and always stay ahead of the game. With this passport to success, you will begin a new journey on which you are among the charismatic, the untouchable...the elite. This easy-to-use reference book will give you a new image you can take pride in helping you to quickly reach your full leadership potential. You will have all the weapons to effectively succeed whenever vibrant, forceful language is required. It works like magic! The Leader Phrase Book is the culmination of ten years of Patrick's personal research on how leaders communicate. It is the summation of his efforts to share one of the most invaluable skills in life: "how to put yourself in command." Patrick Alain is an internationally known developer of some of the best-selling video games, including such titles as the multi-awarded blockbusters Grand Theft Auto and Red Dead Redemption. The Leader Phrase Book was born out of Twitter and has quickly amassed a large following. Patrick was born in Paris, France, and has lived in a number of countries throughout his life. Fluent in five languages, he attributes much of his success to his ability to be a vital participant in large, multilingual teams. Patrick holds a master's degree from the University of Paris, and has lived in San Diego, California, since 2004. "This refreshing and practical tool will help to enlarge, promote, and articulate the world of communication." "An indispensable tool to help you become quickly fluent in phrases that put you ahead in the marketplace." 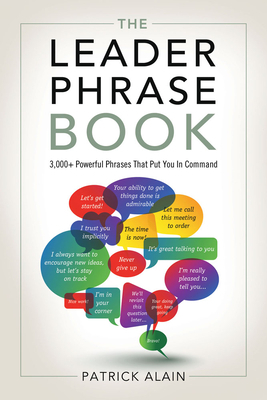 "The Leader Phrase Book is a must read for anyone who wants to move ahead in business."